Today having shining, bright, white teeth has become a norm for our society especially since it is something that is associated with confidence and good hygiene. This however was not always the case. By nature our teeth are not pure white; it used to be that only children and few young adults had white teeth! similar to the development of gray hair, yellowing teeth were accepted as a part of the aging process. Teeth Whitening in Thailand is a quick and easy process to improve the color of your teeth 6-10 shaded in less than 1 hour. Media, current pop-culture, and visually-perfect celebrities have changed our standards for our smiles. Just as you never see wrinkles or dyed-hair roots on a polished celebrity, you do not expect to see a healthy man or woman of any age to have yellow, discolored teeth. Liposuction Center of Thailand offers a few cosmetic dentistry solutions for Teeth Whitening to treat discolored teeth, especially for those discoloration have arisen from external causes. – 1 Hour Laser Teeth Whitening Bangkok via the CoolLight Laser. The results are immediate and can make your teeth up to 2 to 8 shades whiter! Our safe and quick treatment uses a gel that is applied to your teeth and activated by a special laser light. This light activates the gel which gets to work removing stains and whitening teeth effortlessly, giving you a brighter whiter smile that you will want to show off. The Teeth Whitening treatment cost is 6,500 Thai Baht or about 150 Euros. – 1 Hour Laser Teeth Whitening Thailand via the NEW Zoom2 Laser. The Second Generation Zoom System works when the laser blasts light to activate the Zoom gel. The Genuine US made whitening gel is made with 35% hydrogen peroxide, a common bleaching agent. Due to this, the oxygen penetrates the tooth enamel and the dentin to lighten the teeth and remove the stains. 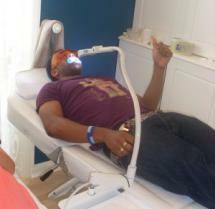 It is guaranteed safe and the process takes a short time with a quick teeth cleaning and 45-minute bleaching session. With the Zoom laser light Teeth Whitening Thailand, teeth can whiten for as much as eight shades more than non-laser activated whitening systems. The procedure promises no or minimal discomfort. People with sensitive teeth would do better to fortify their teeth by using flouride-enriched toothpaste before and after the treatment or choose the CoolLight Laser. With Special pricing form the Thai International Dental Centers of Bangkok The cost of Advanced Zoom2 Teeth Whitening Thailand is about 12,000 Thai Baht or about 272 Euros. –Teeth Whitening Thailand Home Bleaching Kit + CoolLight Laser is available for those looking for more aggressive whitening solution at a price of around 8,500 Baht or about 190 Euros. Please contact us today book your 1 hr Laser Teeth Whitening in Thailand.